Each year, hundreds of scholars and other enthusiasts mark the anniversary of the Gettysburg Address by gathering together in Gettysburg, Pennsylvania for the Lincoln Forum. 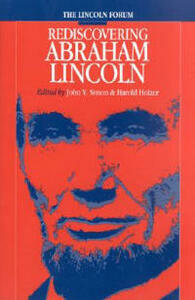 There, leading historians reinterpret and rediscover the legacy of Abraham Lincoln. Now the best recent Lincoln Forum essays are available in one volume, offering important reexaminations of Lincoln as military leader, communicator, family man, and icon.